Every Tuesday Diane at Bibliophile by the Sea hosts First Chapter First Paragraph Tuesday Intros, sharing the first paragraph or (a few) of a book she’s reading or thinking about reading soon. 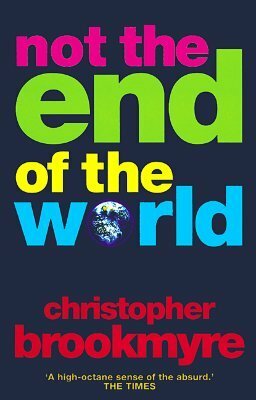 Recently I was looking through my many shelves of unread books and came across Not the End of the World by Christopher Brookmyre, a book I started some time again and put to one side, intending to get back to it quite soon. Time has since whizzed by and now, even though I have a bookmark indicating where I got up to, I’ll have to start it again. Joey Murphy was a fisherman. He was the captain and proprietor of a small trawler that was the whole world to him, but which he knew to be merely a speck on the endlessness that was the Pacific Ocean. He believed in His death, resurrection and bodily ascension. He also believed in ghosts, poltergeists, demonic possession, Satanic possession, flying saucers, alien abduction, Roswell, Bigfoot, the Loch Ness monster, the Bermuda Triangle, telepathy, telekinesis, pyrokinesis, spontaneous combustion, levitation, reincarnation, out-of-body consciousness and the rapture.